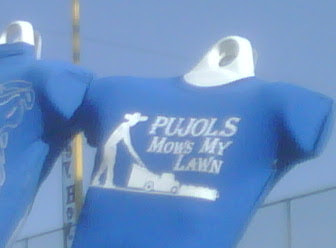 In early May, Joe Sports Fan revealed that the St. Louis marketplace, with its "Zambrano Mows My Lawn" t-shirt, was looking to make a move on the offensive paraphernalia market which is primarily owned by the Chicago Cubs. Well, while randomly wandering around Wrigleyville after the Cubs' 6-5 loss to the Houston Astros, myself and TBDS co-founder Matt Hartwig came across a classy (and by classy I mean equally racist) Chicago response during the inaugural TBDS Day At The Park. My response: "Horry Kow" another offensive shirt! How long until "Lee Picks My Cotton" and "LaRussa Is My Designated Driver" t-shirts come out? Seriously, what's next? Ponder that while I go hide in shame. And This Skid Is Ova! Could 'Turk' Work In Chicago? Is this it for Mike Keenan? Jake Peavy Couldn't Come Soon Enough, Could He? Where Art Thou Josh Vitters? Site News: Guess Who's Bizzack? Chicago White Sox: A little help here Mr. Floyd? So, Who's Getting Busted Next? Where Can I Borrow $500 Million? Hey, We're Not Gone Yet!